Cravings Business Services. For the corporation or small business. Enhance the spirit of the holidays. 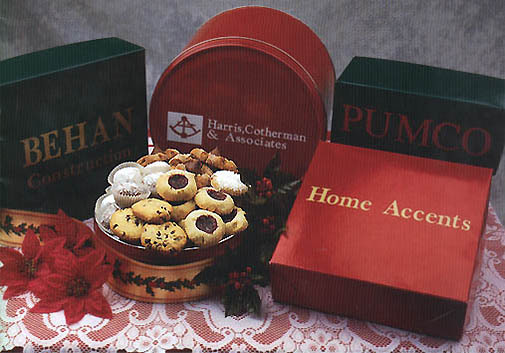 Cravings has just the right business gifts for your company during the holidays. Everyone enjoys home bakes goodies... which is why you'll hear plenty of accolades when your customers receive exclusive selections of our holiday gift selections. Personalization sets you apart. Customized tins or gift boxes with your company greeting or logo become high profile reminders of your company. Choose from any of the items in this catalog. Results are guaranteed! Customized orders must be placed by November 1st for guaranteed holiday printing. A minimum of 24 tins must be ordered for a customized printing. Tin prices start as low as $15.95. A screen and art charge of $80 plus 55 cent extra per tin price will be added. All company orders will receive a 10% discount on the item. The discount does not apply to ink charges or shipping charges. Many items shown can be customized to suit your needs. Cravings Business Services. For the corporation or small business.